On 5 and 6 June this year, millions of people around the world will be able to see Venus pass across the face of the Sun in what will be a once-in-a-lifetime experience. 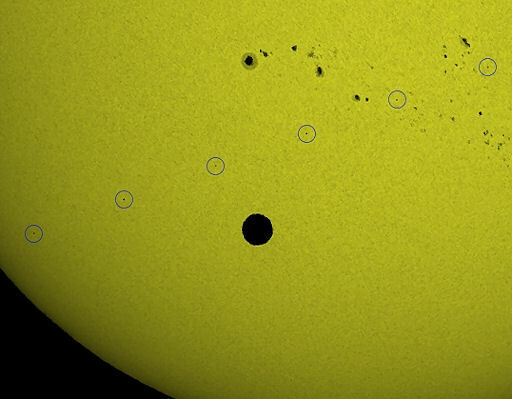 It will take Venus about six hours to complete its transit, appearing as a small black dot on the Sun's surface, in an event that will not happen again until 2117. In this month's Physics World, Jay M Pasachoff, an astronomer at Williams College, Massachusetts, explores the science behind Venus's transit and gives an account of its fascinating history. Transits of Venus occur only on the very rare occasions when Venus and the Earth are in a line with the Sun. At other times Venus passes below or above the Sun because the two orbits are at a slight angle to each other. Transits occur in pairs separated by eight years, with the gap between pairs of transits alternating between 105.5 and 121.5 years – the last transit was in 2004. Building on the original theories of Nicolaus Copernicus from 1543, scientists were able to predict and record the transits of both Mercury and Venus in the centuries that followed. Johannes Kepler successfully predicted that both planets would transit the Sun in 1631, part of which was verified with Mercury's transit of that year. But the first transit of Venus to actually be viewed was in 1639 – an event that had been predicted by the English astronomer Jeremiah Horrocks. He observed the transit in the village of Much Hoole in Lancashire – the only other person to see it being his correspondent, William Crabtree, in Manchester. Later, in 1716, Edmond Halley proposed using a transit of Venus to predict the precise distance between the Earth and the Sun, known as the astronomical unit. As a result, hundreds of expeditions were sent all over the world to observe the 1761 and 1769 transits. A young James Cook took the Endeavour to the island of Tahiti, where he successfully observed the transit at a site that is still called Point Venus. Pasachoff expects the transit to confirm his team's theory about the phenomenon called "the black-drop effect" – a strange, dark band linking Venus's silhouette with the sky outside the Sun that appears for about a minute starting just as Venus first enters the solar disk. Pasachoff and his colleagues will concentrate on observing Venus's atmosphere as it appears when Venus is only half onto the solar disk. He also believes that observations of the transit will help astronomers who are looking for extrasolar planets orbiting stars other than the Sun. "Doing so verifies that the techniques for studying events on and around other stars hold true in our own backyard. In other words, by looking up close at transits in our solar system, we may be able to see subtle effects that can help exoplanet hunters explain what they are seeing when they view distant suns," Pasachoff writes. Not content with viewing this year's transit from Earth, scientists in France will be using the Hubble Space Telescope to observe the effect of Venus's transit very slightly darkening the Moon. Pasachoff and colleagues even hope to use Hubble to watch Venus passing in front of the Sun as seen from Jupiter – an event that will take place on 20 September this year – and will be using NASA's Cassini spacecraft, which is orbiting Saturn, to see a transit of Venus from Saturn on 21 December. "We are fortunate in that we are truly living in a golden period of planetary transits and it is one of which I hope astronomers can take full advantage," he writes. Image showing refracted sunlight observed during the 2004 egress with the DOT telescope in La Palma. Note the changes in brightness and latitude extension of the aureole. Three months before the last transit of Venus this century, scientists are gathering at the Observatoire de Paris to finalise their observation plans in a workshop supported by the Europlanet Research Infrastructure and the EGIDE/PHC Sakura Program. The transit of Venus on 5-6 June 2012 will give scientists two important opportunities for science: firstly, to use Venus as an example of a transiting exoplanet. Astronomers will use the transit to test the techniques they have developed to analyse the composition, structure and dynamics of exoplanetary atmospheres. Secondly, they will be able to make simultaneous Earth- and space-based observations of Venus's atmosphere. These joint observations will give new insights into the complex middle layer of Venus's atmosphere, a key to understanding the climatology of our sister planet. 'This transit of Venus will be the last of our lifetime and will give a unique opportunity to closely observe an Earth-like planet passing in front of a Sun-like star,' said Dr Thomas Widemann of the Observatoire de Paris, who is co-organiser of the workshop. Sky please remind us about this so we can search the web for images and post them back here on thread. which sadly shows we in my part of Africa are gonna miss out on the live siting - booo! which means I am going to tune into a webcam view of it - which I am still to find. Good luck for those in the Easter US and USE proper eye protection! The vast majority of those watching the Venus transit thought all was normal. But astronomers and amateur astronomers, and those who were watching closely for signs that Nibiru was in the vicinity, the aberrant path taken by Venus was all too obvious. Astronomers already know the truth, as in their professions they have access to observatory equipment. They have been silenced, and told to belittle any amateur who questions the status quo. Thus there are a huge number of amateur astronomers who have noticed the Earth wobble and imaged the region around the Sun, seeing evidence of Planet X, who are hesitant to speak out because they do not have PROOF. Now they have proof. The Earth wobble, with the Sun appearing in the wrong place, could be ascribed to bending light or an errant compass, and objects appearing in photos and videos can be ascribed to lens flares or smudges on the lens. But there can be no blaming amateur observers when several observatory webcams, many of them sponsored by NASA itself, all show the identical aberration. CLEARLY the path went in the wrong direction. Venus was of course pushed into position to look as expected, at the start. This was to calm the establishment who would otherwise have arranged for technical problems all around. But as the transit approached the halfway mark, alarm mounted, and the observatory cams were told to confuse the issue. Some cams went offline, showing cheering crowds instead of the drama. Some observatory cams focused on Venus itself so closely that the path it was taking could not be determined. But such maneuvers could not be done on all cams without raising many questions. The SOHO view of the Sun, for instance, which did include the black dot of Venus, could not go offline or focus only on Venus. But it was clear that the establishment was attempting to distract the public from what was being shown – the aberrant path. What will be the outcome? Amateurs will become emboldened, and not be dismissed. They will talk to others, and the rumors of a planetary body in the inner solar system will spread! The transits of Venus should be absolutely predictable down to the last inch and position. Yet the official astronomical community has fallen silent! What this points to is a cover-up over the presence of the Planet X complex. If the cover-up plans to zoom an imaginary planet in from the Kuiper Belt to explain what the public is seeing in Red Filter photos, or to claim that the Sun has developed quad poles to explain the disturbed Earth magnetosphere and daily wobble, then they are TOO LATE. The truth is out there! Venus is not a magnetic planet. It did not take this path because of some gravity influence beyond Neptune or a quad pole on the Sun. It took this path because something HUGE, a gravitational giant, was to the right of the Sun and in its orbit. That something is Planet X, announcing itself in no uncertain terms. This is the proof that amateur astronomers have been waiting for, the proof that explains all the signs that have been present since 2003. The pieces of the puzzle are falling into place. Fueled by anger of years of being belittled and dismissed, amateur astronomers will be a force that refuses to be silenced! What a cool find recall! It was waaayyy cool, Sky! Thanks for posting all the info. Tried to make a view with a pin hole camera (two sheets of paper with a pin hole) - yeah, NOT! These old eyes couldn't see a thing! Wound up watching it on NASA TV! "I was in north-east Australia for the full transit of Venus and a transit of Hubble in the middle," says Legault. "My Nikon D4 digital camera was working at 10 fps on a Takahashi FSQ-106ED telescope to record 9 images of HST during its 0.9s transit." This is certainly an historic photo. Imagine what James Cook would think of a telescope in space crossing his field of view as he watched the transit of 1769 from a beach in Tahiti. Moreover, imagine what kind of telescopes will be crossing the sun when the next Transit of Venus occurs in 2117. Congratulations to Legault for capturing a truly rare 0.9s slice of history. Satellite is on a Lagrange Point, its means that the Satellite did not move at all or the image of the Sun will move too, but it didn´t. as we so long ago explained. This occurred because as Planet X passes the Sun it does so within the region of the orbits of Earth, Venus, and the Dark Twin. Planet X first crossed Earth’s orbit in December, 2003 when the Earth encountered Planet X, halted her orbit due to this massive presence, and has subsequently been pushed back in her orbit by the retrograde motion of Planet X to what would normally be Earth’s August position. As Venus and the Dark Twin came round in their orbits, they encountered this same obstacle and also halted. Venus has been moved back and forth in the cup, in order to simulate its normal orbit for Earthlings, in accordance with the Element of Doubt rule imposed to reduce panic in the trigger-happy establishment. 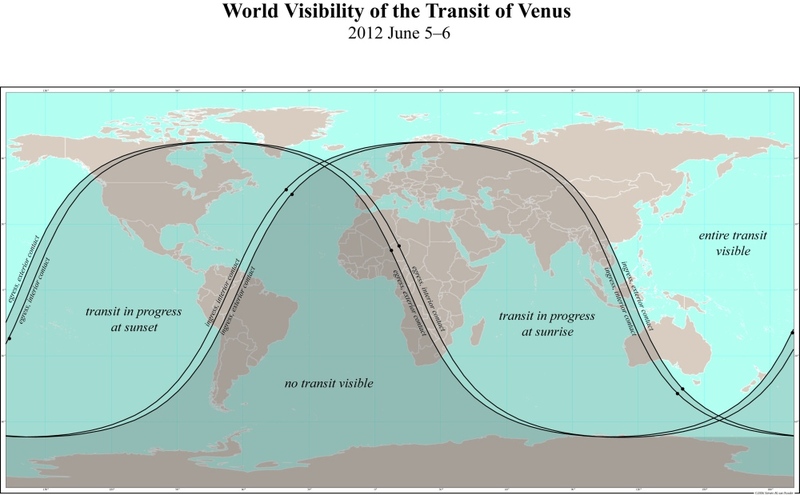 That said, what occurred during the June 5-6, 2012 transit of Venus? Venus was pushed into position at the start of the transit, as we mentioned, so as not to panic the establishment. By the time they realized the path was not going according to the PUBLISHED path, it was too late. Their anticipated path was already in the news, already in the hands of amateur astronomers, and cameras were recording all over the globe. To recover, the establishment tried to zoom on Venus, so the path could not be determined and they will try to confuse the public by tilting the Sun in images so the path slants. But this will not succeed, as sunspots move with the Sun’s Ecliptic, rotate with the Sun, so comparisons can be made. NASA cannot hide what happened. What of the Venus wobble, noted by many, that seemed to take a waved path across the face of the Sun. This is not apparent in a moment-by-moment view, but a rapid transit is obvious. The establishment is quickly trying to explain this wobble as motion in Sun-centric satellites, which are claimed to move up and down and thus, being closer to Venus than the Sun, this makes it appear that Venus is moving. But the distance Venus would have to move to create this wobble SEVERAL times within the 6 hour transit is not feasible, nor does this occur. Did Venus bobble up and down during the transit? It is struggling with mixed messages, one from the Sun to stay in its established orbit, another from Planet X to stay ABOVE a conflict with the gravity press from this monster just to the right. The dither, or wave form, was real.